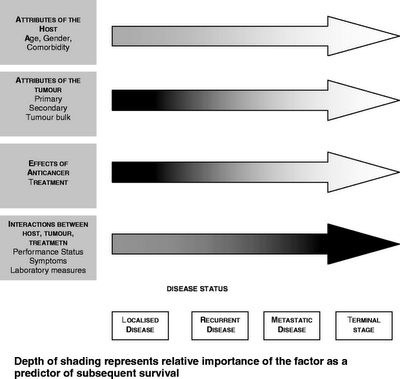 First is a systematic review of prognostic factors in patients with recently diagnosed incurable cancer. While most of us are familiar with prognosis in patients with advanced cancer, and the supreme importance of functional status in prognostication, we (at least I am) are much less familiar and skilled with prognostication for people earlier on in their disease (i.e. at the point of first diagnosis, when their ECOG scores are still 0-1). I have always been taught, and continue to believe, that in these circumstances tumor characteristics (type of cancer such as lung vs. breast, histologic grade, tumor burden, early response to chemotherapy, etc.) are more important than patient characteristics (functional status) and this review overall bears that out, although they do find that functional status is important early on as well. The review is not helpful for actual bedside prognostication unfortunately (that would be too easy)--it is more of an academic overview of what is known. One surprising finding is that advanced patient age doesn't consistently indicate worse prognosis across the studies they looked at (this does, I guess, further highlight the importance early on of tumor & not patient characteristics). Second is a review looking at the clinical significance of quality of life assessments in cancer patients. I was hoping this was going to be the holy grail of qol assessment reviews which I could stick on my desk and every time I read an article whcih reports a change of X on the EORTC-CQC-QOL-30-version 2.3-modified-FACIT-Lung-Combined quality of life I could reach to this article, flip a few pages, and conclude, "Oh, a change of X is a really good outcome," or some such thing. Naive? Indeed. The review is actually a well-balanced look at the difficulties of interpreting and applying quality of life assessments to clinical practice. It basically gives a nod to my previously described wish and then notes that is impossible with the current state of the science for most of the (and there are so bloody many) quality of life scales/tools used in cancer research. The article is a helpful introduction as to why this is a difficult task, and to me highlights the need to use qol tools in clinical trials which are clinically interpreter to the non-qol-researcher. Critical Care Medicine has dedicated the supplement issue to ICU collaboration with Palliative Care services. Many of the articles are written by key players in ethics and palliative care including Truog, Schneiderman, Billings and Byock. The articles are not free full text access unfortunately, but they do cover some important areas if this is your interest. 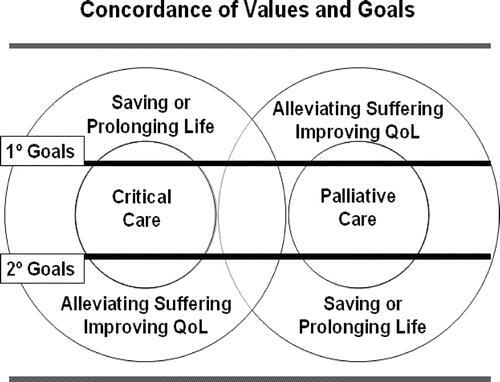 One interesting new graphic to describe the differences and similarities of the ICU and Palliative Care came from the article by Byock, "Improving palliative care in intensive care units: Identifying strategies and interventions that work"
Most basically, intensivists and palliative care professionals both care for the sickest patients in the healthcare system. As with patients in an ICU, those referred for palliative care consultation or admitted to hospice programs have life-threatening conditions, often involving multiple organ system failure or insufficiency. Critical care and palliative care patients typically are taking 8-15 prescribed medications, despite efforts to avoid polypharmacy and drug-drug interactions. 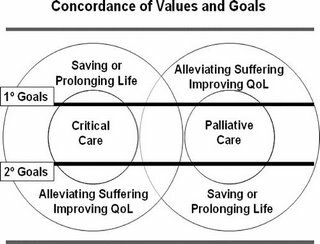 Although the primary foci for palliative care and critical care may initially seem divergent, on inspection, strong concordance of therapeutic values and goals is apparent. Indeed, the primary goal of each discipline is the secondary goal of the other. This says elegantly what I have always tried to advocate for to patients, families, nurses, managers, and attendings in the ICU. There are a lot of key articles in here dedicated to implementation of Pall Care programs in the ICU, so if you are a 'palliatist' on your way to creating a new program, these are key articles you want to share with your colleagues in the ICU since it comes from a journal dedicated to ICU care. Also for those of you who are starting palliative care programs I would like to share this little anecdote from my day today. Our palliative care census at a local community hospital (200 beds) was at 6 this morning. We received 5 consults today and set up 4 family meetings. Busy day. Two of the family meetings were with patients and families we had met 3 weeks ago and 6 months ago. Both families had shared they were glad and releived that we (palliative care) were involved again because they appreciated out whole-patient approach. They felt as if their loved one and their family were both treated with respect and that our team did an excellent job of sharing complex medical information. They both also said how that helped them match their goals to what the reality of the situation was without feeling pressured. Now I am not trying to deomnstrate that I am a great doctor or that I have a great palliative care team. We have been in service at this hospital for 7 years and have developed this team over time. Days like this make it much easier to face the daily emotional strains of dealing with difficult ethical, medical and psychological situations. So if you are creating a palliative care team, are on a palliative care team, or working for a hospice agency, I want to share this appreciation with all of you, just in case you did not hear it from someone today, because these families were really thanking our approach to health and illness, life and death, and I know there are many more teams like mine out there. So keep up the good work. Elderly patients' understanding of CPR outcomes; Pallimed layout changes? 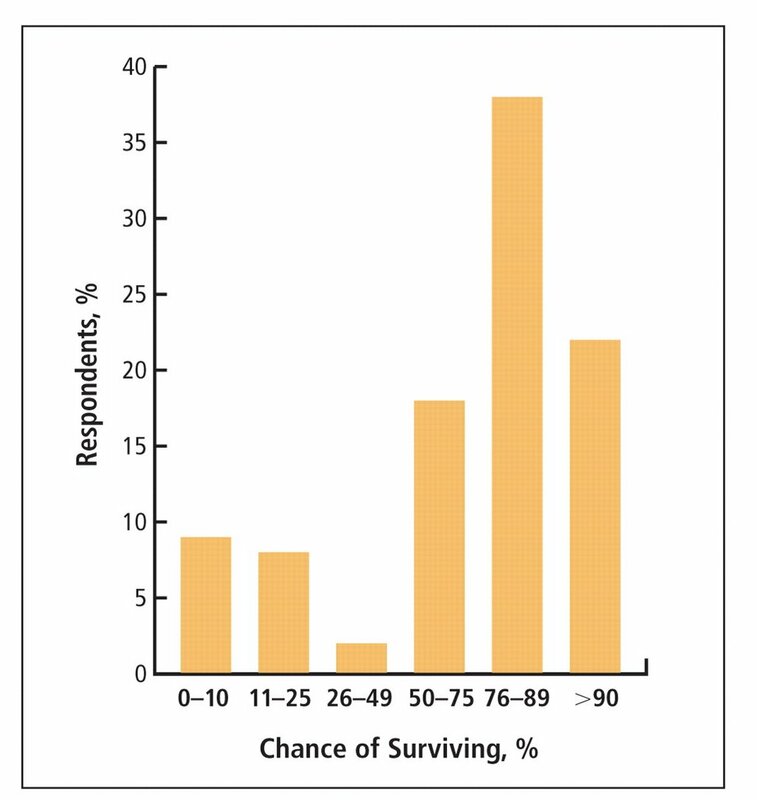 1) Over 80% of respondents thought they had better than a 50% chance of survival to discharge (see figure). 2) More patients reported they got most of their medical information from television than from their physician. a) We are told that 70 elderly people at this institution were "chosen randomly" from the inpatient wards, the ER, and primary care clinics; we are never told how these people are actually chosen & for all we know a researcher walked around with a pad & pencil and 'randomly' selected old looking people for the study. b) The article doesn't include the nearly-ubiquitous "Table 1" describing basic demographic and clinical details of the subjects. We really have no clue who these people are other than their age category and they were sitting around this medical center one day. c) The most basic of statistical analyses are absent, including the most obvious analysis looking to see if having a pre-existing DNR order or living will was correlated with a more accurate assessment of CPR survivability or not. I'm not asking for a complicated multivariate analysis here--they had the data to answer this simple question but didn't I guess bother to do it. All of this is quite frustrating, limits the impact of this sort of research, and all together seems like a squandered opportunity. Pious criticism aside, their findings are certainly grossly accurate (people greatly overestimate the benefit of CPR) and you've got to wonder if it would be a worthwhile public service campaign to educate people just how ineffective this procedure is in most sick, hospitalized patients. Unlikely to happen, & as I think about it unlikely to make a difference either. There will continue to be those (thankfully rare) patients and families for whom anything other than maximum medical intervention will be seen as giving up or somehow giving in to death. Most patients/families aren't like this, and with a straightforward discussion of ways to be cared for as they die, along with a physician recommendation to not undergo resuscitative efforts, they will be agreeable to a DNR order. In medicine we can't change what's on TV, but we can change how, and how often, we talk with patients about these matters. The problem, of course, is that as a profession we do this very poorly, and "code status" discussions--when they occur at ll--are often no more or less than an intern asking a patient "If your heart stops do you want us to restart it?" Put that way, I'd say "Yes" too. The New England Journal of Medicine has published a trial of atypical antipsychotics for agitation/other behaviors with dementia. The multicenter trial randomized ~420 patients with dementia and behaviors (agitation, aggression, psychosis) to risperidone, quetiapine, olanzapine, or placebo; patients were followed for 36 weeks. The starting doses were fixed, but clinicians could titrate the drugs as they saw fit. The major outcome was time to discontinuation (due to lack of efficacy or side effects). Overall the results weren't very encouraging. Risperidone and olanzapine seemed to be more effective than quetiapine or placebo (time to discontinuation due to lack of efficacy 22-27 weeks); this was outweighed by their increased rates of discontinuation due to adverse effects such that overall the time to discontiuation was similar between all agents and placebo (5-8 weeks). These findings, along with the (likely) increased mortality from these agents, argue against their routine use in dementia. As with many similar interventions, a major problem is selecting patients likely to benefit without limiting side effects. How to do this--no one knows as of now. A couple palliative care focused follow-up points. 1) This issue is entirely separate from the acute management of delirium/similar symptoms in the medically & terminally ill. 2) Looking at the side effect findings, this study supports the concept that quetiapine causes fewer extrapyramidal side effects than other antipsychotics. Journal of General Internal Medicine has a piece about the importance of spirituality in African Americans' end of life experience. It is basically two physicians' & and a chaplains' thoughts about African American spirituality & religious belief as they witnessed it at the bedside. It's really a brief phenomenology of their patients' religious statements. They state they haven't found an increased desire for more aggressive medical care at the end of life in their African American patients compared to their other patients. That is fine but the findings supporting that in general African Americans advocate for more aggressive medical care at the end of life than non-African American patients has been a finding replicated multiple times in quantitative studies, so I'm not sure what they're getting at. Archives of Internal Medicine has a study of 'brain dysfunction' in the chronically critically ill . It is interesting because it provides a natural history of these patients. (By chronically critically ill they mean patients who require extended mechanical ventilation in an ICU such that they eventually receive a tracheostomy and are sent to a chronic vent facility.) The study looked at ~200 patients at a single institution who were discharged to a chronic vent floor; mean age was 72 & the patients were ventilated for a wide variety of reasons. They found a high burden of 'brain dysfunction' (delirium, coma, etc) not surprisingly. The longer term outcomes were what interested me: over half the patients had died within 6 months of being sent to the chronic vent floor; 30% died in the facility; less than 20% of patients were discharged to home or a rehabilitation facility (the rest died, went to another acute setting, or went to a long-term care facility); ~60% of survivors at 6 months were dependent in all activities of daily living; and 71% of 6 month survivors were so cognitively impaired that they couldn't participate in a telephone mental status examination. Yikes. So, in this institution's cohort: if you went to a chronic vent facility, chances are at 6 months you'd be dead, and if you weren't chances are you'd be significantly cognitively impaired. I don't have much to say about this other than it's valuable prognostic information. I hope a similar multi-institutional study occurs to see how if these dismal prognostic figures are generalizable nation-wide. Well I'm back from Montreal and have a seemingly insurmountable backlog of things to blog. Pain Medicine has a comparison of the bioavailability of oral versus sublingual ketamine. If you include serum levels of norketamine (which from a clinical standpoint you should as norketamine is analgesic) both routes had similar bioavailability. Supportive Care in Cancer has an interesting article about patients' & their caregivers' understanding of cancer treatment goals (e.g. curative vs. non-curative). What is interesting about this study is that the subjects' understanding was followed longitudinally. It's a think study with a lot of details that I'm not going to summarize. The authors have contributed a lot in the last few years to this area and it's good to see more interesting research coming from them (see here & here). Cancer Investigations has a review on the palliative care of the terminally ill drug addict. This is truly a data-free topic (as far as I can tell there is no research into this) and the authors give what seem like very reasonable recommendations. This is a topic that causes a lot of anxiety for some and I'd recommend this article for the old teaching file as there's very little, even in the way of expert opinion, writing about this (the NCI's PDQ has an OK overview about substance abuse and the cancer patient). **This sentence was a joke. Well, keeping well-read on all the latest medical journals is just part of what we do here at Pallimed. But as I heard over and over again in medical school at UCSD, it is important to be a well-rounded person. So in my free time I really enjoy reading music blogs, so I can find new bands with new sounds, and not get stuck only listening to music I liked in high school or college. So luckily I stumbled over a post on Stereogum which had a link from Rock Daily, which had a link from the BBC about a survey done asking 5,000 British people what song they would like played at their funeral. Here are the top 10 songs Brits would like played at their funeral. The Bereavement Register is a service organised (I will even type in the Queen's English) by a direct mail company to decrease the amount of mail sent to a deceased person. Yes you read that right, a company that sends you junk mail that you don't want is behind this very kind service. The Bereavement Register has found that a deceased person in the UK receives on average, 80 pieces of mail. They have accomplished quite a bit since being founded in 2000, even expanding to France and Canada. They also have an acoompanying service to prevent unwanted telemarketing calls. By including this registration information on all death certificate envelopes and getting the support of the funeral industry they have provided a pretty good service that probably goes unnoticed, since as a bereaved family member, you would only become upset or frustrated if you receive the unwanted direct mail. Anyway, I wish we had one of these services in America. Maybe we already do, but I have not heard about it. I wonder if anyone has ever surveyed family memebrs about unwanted solicitation after the death of a loved one. If I only had a research centre, and a million pounds.